The annual harvest collection is underway in Senior School at The Grammar School at Leeds (GSAL), with all donated goods destined for the Leeds charity St George’s Crypt. The collection follows those held at Rose Court and Junior School in support of the Crypt before half term. For 87 years the Crypt has been supporting the homeless and vulnerable in Leeds, helping them to rebuild stable and positive lives. Today the Crypt has been transformed from a dark basement into a light and airy space, where around 100 people can eat a hot lunch each day and up to 50 can find a bed for the night. As well as meeting these immediate needs, the Crypt offers health and wellbeing programmes, and development and training opportunities within its social enterprises in retail and catering, helping people gain the skills and confidence to return to employment. GSAL welcomed two of the Crypt’s team to school today to talk in assemblies about the charity’s mission and how the donations of food and other goods are vital to their work. 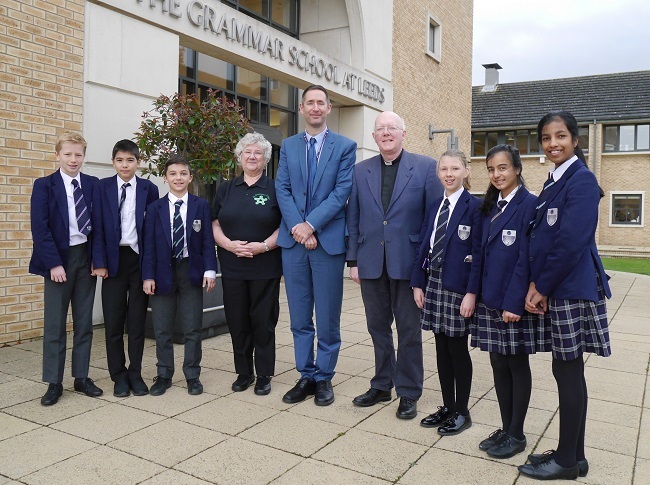 Rev Roger Quick, chaplain to St George’s Crypt, spoke in Year 9 assembly and volunteer Leslye Thomas spoke to Year 7 pupils. Roger said: “I’m here to say thank you on behalf of those people you’re helping. Your generosity means a great deal to us at the Crypt as we can feed the people who come to us. Homelessness can happen to anyone, and people come to us in desperate need from all backgrounds. The collection in Senior School continues until Friday 23 November.